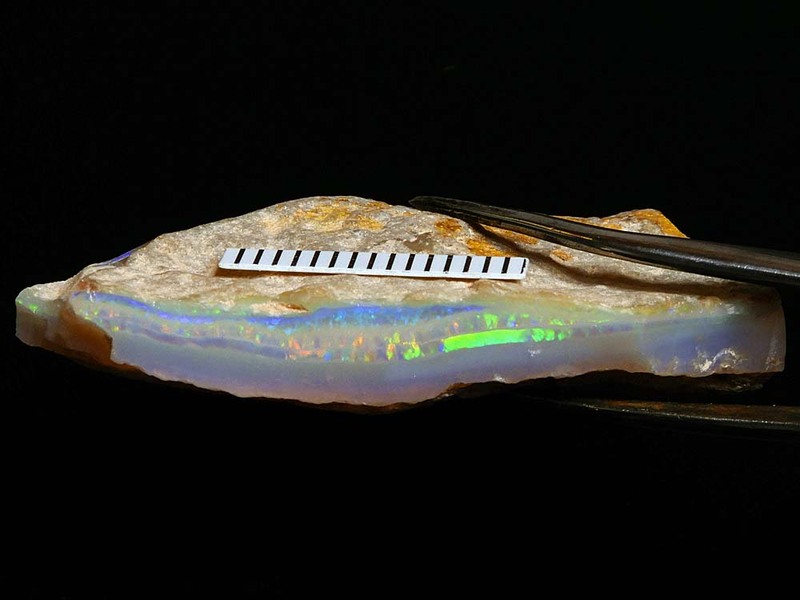 BIG 18.4 gram rough Coober Pedy opal with orange/green/blue/gold play-of-color. I brought back a lot of opal, during my 2017 opal buying trip, from 15 Mile opalfield...and this is one of the larger single stones. 15 Mile Opalfield, just east of the Stuart Highway, is really part of large 14 Mile Opalfield and one of the most commercially active (and important) opalfields in the huge 15,000sqkm Coober Pedy Precious Stones Field. 18.4 grams/92 carats. Dimensions: 51mm x 30mm x 12mm thick. Scale=20mm.